Få et tæt kig på Islands utrolige vulkanske landskab på denne vandre-dagsudflugt, der omfatter 4x4 jeeptransport fra Reykjavik og et besøg i Seljalandsfoss Vandfald. 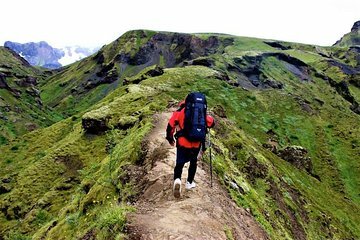 Vandre rundt om kratre og køle lava på en guidet 16 km vandretur fra Basar til Femvorduhals Volcano i Thorsmork Valley. Langs vejen lærer du om landets høje koncentration af vulkaner og nyder regelmæssige stop for at hvile og tage billeder. Afgå fra dit hotel i Reykjavik i en 4x4 jeep, der er specielt tilpasset til at løbe glat gennem Islands rude terræn og gøre dig sydpå til Thorsmork-dalen, hvis kæmpede landskab er omgivet af tårnhøje kløfter og gletsjere. Vind gennem foden af ​​Eyjafjallajökull Glacier, stoppe kort for at tage billeder på Seljalandsfoss Vandfald, inden du kommer til Basar, et vandreture midt i dalen. Lyt til en sikkerheds briefing og derefter afsted bag din guide i et stabilt tempo. Ruten er 12 miles lang og tager dig af Fivevorouhals Volcano, en aktiv vulkan, der eksploderede til at være i 2010. Zigzag op stejle stier forbi kratre og nedkøling lava falls, tager i enestående udsigt over højlandet. Når du går, høre om landets landskab og vulkanaktivitet fra guiden. Omtrent halvvejs gennem vandreturen stopper du med at spise den madpakke, du medførte (selvomkostninger). Din 6-8-timers vandring slutter i Basar, hvorefter du vil køre tilbage til dit hotel i 4x4 jeepen. Bemærk: Stierne er forholdsvis stejle og kræver en god generel egnethed. As I was traveling to the start and for the first couple miles I thought maybe it was a bad idea. Then I forgot about the steep climb, narrow trail and enjoyed the awesome landscapes unlike any other where I have hiked. Our guide was helpful, encouraging and informative. We were in Iceland for 10 days and booked an excursion every day we were there. This excursion was the BEST of them all! Tour was amazing. Definitely physically challenging. Need warm clothes and good boots. But anyone up for the challenge the view is definitely worth the effort. This is a must do for anyone wanting to see the best of beautiful iceland. This trip was amazing! Probably the best trip I had during my stay in Iceland. Mat and Heather are not only experienced hikers but also passionate travellers themselves, they have been very professional in guiding the team. Would definitely recommend this trip to anybody who loves being active! Relativ leichte Wanderung in faszinierender Bergwelt. Sehr guter Bergführer, hilfsbereit und zuvorkommend. We had a great time on the volcano hike. Just need to say that we haven't been on the volcano as is in the description but in the mountains. However, all trip was very good organised. Our guide was just great!!! He has a very good knowledge about mountains and he treads group members with respect. He was very helpful and had a great sense of humour. Amazing tour and great guide! Make sure you are dressed properly. You will definitely need a hat, gloves, waterproof pants, waterproof jacket, and good hiking shoes. You do need to be in good physical shape. The views were outstanding. The ride in is kind of bumpy, so you might want to bring some non-drowsy Dramamine if that's an issue for you. This was by far my favorite thing that I did in Iceland! We culdn't go up to the volcano because of the weather, but the alternative destinations our guide took us to were great and there was a lot to see. A physically demanding hike, but the sights were worth it. The jeep ride through the valley was an experience in itself. We had an awesome time, but didn't get to do the entire hike because of time and difficulty level for some. It's a long and challenging hike, which I enjoyed, but read the small print: you should be in good shape! You might not enjoy it otherwise! Spectacular views beautiful surroundings! The Volcano hike is spectacular in views and scenery. It is a very thrilling experience. Billy our guide was knowledgeable and entertaining. The hike is also very, very physically demanding 20km roundtrip and those who can not do a 20km walk that is uphill should think twice. Also, if you have fear of heights, this is not for you!!!! 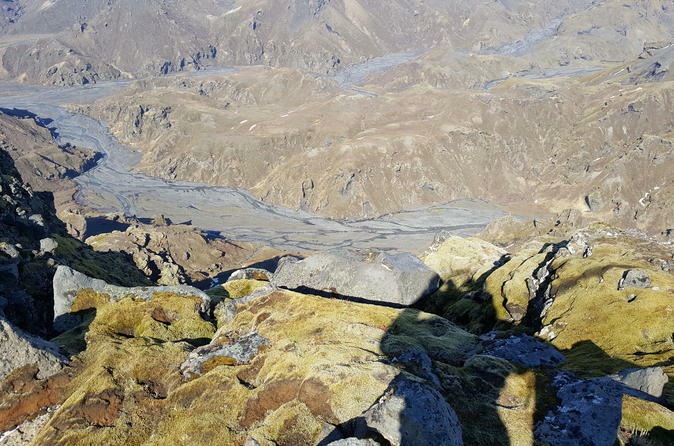 Some of the walks are very frightening and terrifying if you have vertigo or any fear of high places.